I don't have time to keep this blog up to date with developments much anymore, but historically I did cover, and try to promote, the "flashride" (originally called "flashmob") cycle protests that started in London on 20 May 2011 at Blackfriars Bridge. These did a lot to move cycle safety up the London political agenda, and were more effective than many years of organising petitions, letter-writing, and polite diplomacy from London Cycling Campaign, although the immediate objective, a safe design for Blackfriars Bridge and its junctions was not achieved, and has still not been. Despite this rise in the political prominence of the cycling issue, there is still very very little tangible progress on the ground in London. The Mayor's Vision for Cycling was published 17 moths ago, and a greeted it quite enthusiastically, but with substantial concerns and caveats. These now seem to have been very well-founded. Since then, no cycling infrastructure, resulting from that vision, of any substance, has been built at all. One wouldn't have expected things to start at once, of course; plans need to be laid, people put in place, and things need to be done in a sensible order. But that should only have taken about a year. The summer is when things are built on the roads: if much was ever going to happen, we would expect it to be happening right now, in a very obvious way. It isn't. I'll have to do a longer post on what appears to be going wrong with progress on implementing the Vision at some stage soon; however, my purpose now is to note that there seems to have been no fundamental change in attitude at Transport for London towards bicycles as transport. There are certainly some good people working at TfL, and I don't doubt the sincerity of Andrew Gilligan, the Mayor's Cycling Commissioner, but it is clear that the message of the Vision just hasn't got through in practice to most of the people to whom it needed. So we still see consultations on major schemes for junctions and stretches of roads controlled by TfL where fundamental design change is needed in favour of safe cycling, and where TfL is deluged with informed and precise responses from lobbyists for cycling telling them exactly what they need to do, and yet these demands are swept aside much as they would have been 10 or 20 years ago. The Kings Cross junction is a high-profile case in point. This should have been one-of TfL's highest priorities for installation of high-grade cycle infrastructure, whatever the effect on motor vehicle flows, because of the number of cycling fatalities that have occurred there (three that I know of in eight years, the last of whom was Min Joo Lee (Deep Lee), killed at the same spot in identical circumstances as another cyclist 14 years earlier). 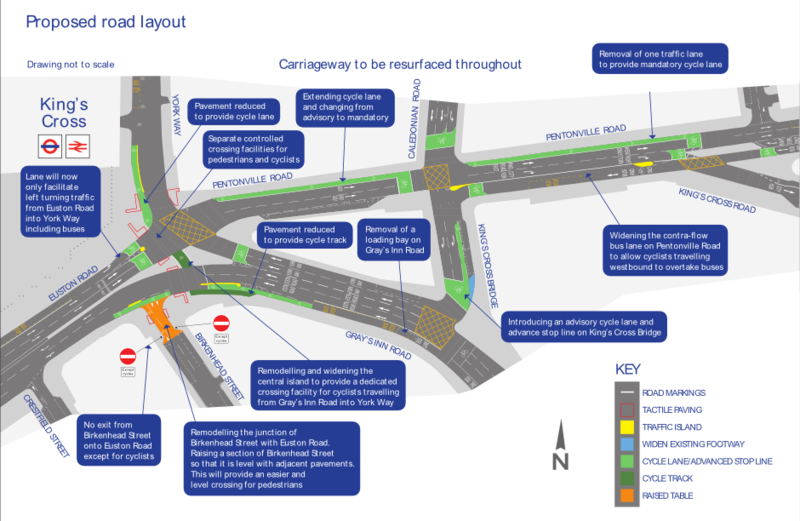 There is indeed a scheme on the table for significant and expensive and disruptive remodelling of the junction. For cycling, however, it amounts to a pretty old-style feeble paint job that does not provide the physically separated space and separate, direct signal phasing we need for truly safe and inclusive cycling through this horrible junction. There are some improvements to the current situation. For example, a widened cycle lane, the addition of ASLs in some places, and a tiny bit of segregation. But while these are improvements, these will only improve conditions for vehicular cyclists, and will not attract new cyclists. He has his own worked-up plans for a proper, high-quality inclusive cycling alternative design, which you can see on his blog. So once again, London cyclists need to take direct action to show the powers-that-be that progress on safe cycling in London for all is too slow, too half-heated, and that we can't accept this green lipstick on a pig at King's Cross and similar junctions. Tonight's protest has been organised independently from LCC, but I have no hesitation in supporting it, and I will be there. It starts at 18:00 on Kings Cross Square, and sets out at 18:15 on this route. There is more information on a Facebook page. If you can get there, please respond to this late plea, and do add your presence on foot or on bike to help us make an impact. If Transport for London discovers that they get disruptive, media-savvy and politically challenging protest every time they approve a scheme like this that falls so lamentably below the aspirations of their own Mayor's Cycling Vision, maybe that will have an effect. I can't guarantee it, but it is the best I can suggest until we have the next election for Mayor. Only seven junctions missing? A bit of an underestimate I would have thought.